Although I have never been a big fan of Anime and have only seen a few of the movies that were products of Studio Ghibli, I fell in love with The Secret World of Arrietty, which came to theatres in the U.S. on February 17th, 2012. I was actually lucky enough to get to see it well before it arrived in theatres, and it was very hard for me to not tell anyone–including my husband–about this great new movie that I had gotten to see as Disney’s guest while in Los Angeles. The Secret World of Arrietty is based on Mary Norton’s beloved children’s novel The Borrowers. Immediately after seeing the movie, I downloaded the novel, which I then learned was the first book in a series about “little people” who live in the homes of humans. I still haven’t read the book yet (shame on me! ), but plan on reading it this summer and then getting the rest of the books, too. Arrietty (Bridget Mendler) is a young girl who lives with her father and mother underneath the floor of a human family’s home. To get everything they need to survive, Pod (Will Arnett), Arrietty’s father, “borrows” items that the humans have forgotten or will not miss. As Arrietty turns fourteen, it is time for her to learn how to “borrow” because someday she will no longer have her parents and will need to know how to fend for herself. There is only one rule, however: do not be seen by the humans. The Secret World of Arrietty was a movie I really wanted to add to my film collection. My 4-year-old daughter may not be ready for this movie yet, but I am really excited to share it with her and talk about all the themes and relationships depicted in this film. Arrietty is a terrific role model: she respects her parents, is fearless and adventurous, and doesn’t judge others in the same manner that others of her kind do. I loved the relationship between Arrietty and her father; Pod is the strong silent type, and will do anything to protect his family. Arrietty definitely gets much of her character from him, but also thinks for herself. After watching The Secret World of Arrietty on the Blu-ray/DVD combo pack, I am eager to take a lesson from Arrietty and give Studio Ghibli another chance to delight me. I’ve already seen Ponyo and Howl’s Moving Castle (both of which I’d seen prior to The Secret World of Arrietty), and I suspect that I will also really enjoy their other offerings. 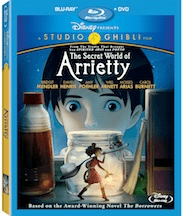 The Secret World of Arrietty came out on Blu-ray/DVD on May 22nd, 2012 so you can relive the magic of Arrietty’s world over and over, sharing it with the special people in your lives! Original Japanese Storyboards I only recently learned about how storyboards are used in animation, so this was a very special feature to me. You can watch the entire film with the storyboards (which are done prior to the finished animation to give the directors and animators guidance) and all of the voice-overs and music from the film. “Arrietty’s Song” Music Video There is some seriously beautiful music in this film, and I loved the Cécile Corbel song. In this video, we get to see the musicians performing the song. I was mesmerized watching her play the harp! “Summertime” Bridget Mendler Music Video Bridget Mendler, the voice of Arrietty, wrote this song while on the set of the TV series Good Luck Charlie. It’s a feel-good song about summertime and falling for your best friend, and it ties in nicely with the relationship between Arrietty and Shawn. In the music video, Bridget appears to be “little” and everything around her is big. There’s even a cute boy in the video! The Making of “Summertime” Bridget Mendler talks about when she wrote the song, what it means to her, and how the song got the honor of being used in the movie. I can’t wait to see this movie, I have grown up watching the Borrowers most of my childhood and love the fact that they made yet another. I would rather a live action as they have done in the past, but anime is great too!! My daughter loved this movie…she’s been watching old Borrowers on Netflix, one of my favorite shows when I was little.